The glaciers melt; the streams from them gush with fresh water. The Swat River and its tributaries spurt. The fruit laden orchards of peaches, apples, apricots and plumps bloom. The whistles of gypsies, seasonal nomads, buzz and the bells of sheep ring. This is summer in Swat. Since the last successful military offensive against the Swat Taliban the military in Swat arrange festivals in the valley. These events of entertainment are meant to revive tourism in the valley and to present a soft image of the idyllic landscape to the world. And of course one objective is to prove that Swat is now ‘cleared of militants and that the operation against the Taliban has been successful’. Whatever the motives are, one thing is crystal clear, that the festivals have effectively revived the domestic tourism to Swat which was damaged by the militant crisis and the worst ever floods in the valley. The only hurdle to a complete revival of this means of livelihood is the shattered infrastructure particularly the main road and other access roads. Swat Valley is among the cherished destinations of common tourists. Besides, it has many sites for mountaineers, trekkers, hikers, winter sportsmen and drifters which are still to be discovered and promoted. 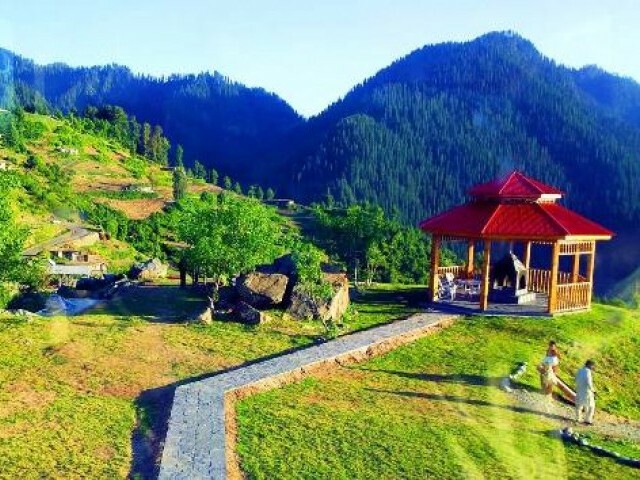 The Swat Summer Festival is annually held in Kalam and in Mahee Dhaan (Mahu Dand) — an enchanting valley and lake at an altitude of 10,500 feet from sea level — which can by now be accessed via every type of vehicle. It is 35 km from Kalam. It takes two hours to reach there by the bank of an emerald stream from the lakes and glaciers above the valley. The festival in Kalam and in Mahee Dhaan commenced on June 19 and will continue for a full four days. There will be jeep racing, cliff climbing, paragliding, trekking and rowing in the lake. The festival in Kalam will have live concerts, songs, dances and stalls for families. One distinct characteristic of the Swat Summer Festival this year are the shows of local — Torwali and Kalami (Gawri) — culture. The local but unique culture and the languages are endangered. Presentation of it in the festival is meant to educate the tourists on the unique non-Pashtun identity of the people of Bahrain hill station and Kalam. It is also meant promote the particular languages and culture and to take the local people on board. The local population, other than the shopkeepers and hoteliers, are not pleased with what was happening on their land in the name of such festivals, primarily because of the damage tourists do to the natural environment. A number of the native civil society of Bahrain and Kalam expect care from the tourists whom the locals always called Melaesh (guests). Unfortunately, in Pakistan, the environment has never been a priority among the general public. Neither is it a priority in the governments. During a very recent reconnaissance visit to the Mahee Dhaan (Fish Lake)—the most cherished location of the festival, this scribe was shocked to see an abundance of plastic bottles, wrappers and other waste scattered on the green patches and the surface of the lake. Similarly, these tourists have no regard for the trees, big and small. The brutal and unchecked fishing in the lake also damages its beauty. In Swat, unfortunately, rowing is not done with oars. This causes a lot of pollution in the water as petrol engines are used to run the boats on the lake. Canoes with oars would be great for the environment and a much-needed measure to maintain the beauty of the lake. The lake area is the best place for short time camping, tents brought in by tourists help them stay among fairies for few days. There are short treks on the peaks; and paths for similar adventures. The sun rise here is worth capturing and the nights are no less gripping and fortunately, on the days of the festival, the night skies will be lit up with moonlight. One really can’t compare the feeling of being among the stars underneath a clear sky; it’s as if the angels from above send down fairies to greet you. The local cultural presentation and shows in the festival were included by a local civil society organisation, Idara Baraye Taleem-o-Taraqi (IBT), based in the area. This would be the first ever public display of the indigenous culture. The particulars of the presentation include concerts, traditional dances, instrumental music; stalls for daily use items and local cuisines. Come meet the tribe, come feel the relief from the sweltering heat; plan a trip to Swat and escape the ruckus of a city life for a couple of days! Retreat to the heavens on earth, we all deserve a break. I remember visiting Swat with my family when I was a kid. I cannot wait to go back; I remember I was amazed by its beauty. Hopefully people from around the world will feel safe to go there and enjoy its natural beauty. Swat Kohistan is more beautiful than Swiss Alps but its inhabitant are ignored by the govt. The local people have not been provided any benefits. The beauty of this are is always cashed by the other influential community. This festival was arranged very good but still the local people are not happy because of the following reasons. the arrangement were not good for the civil people even a civil person had no right during the festival. importance and the choices were followed mostly of the army. Even at Mahodand, stall were given to out of KP people and the local people were just working as a labour. On a long trip through the Indian subcontinent I visited Swat in november 1980, so long ago. We stayed in the north at Kalam, the end of the road. At night it was cold, at day it was a silent and very beautiful place with very high snow covered mountains and the beautiful colours of autumn. At that moment we were the only foreigners in the small settlement. I got that great feeling of being at a very far-off place. Further to the north there were only large areas with wild mountains with few people living there. One imagined Tajikistan at 150 km, then part of the Sovjet Union, then further to the North the deserts of Kazachstan en forests of Siberia.